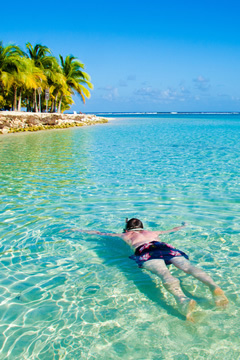 Belize boasts some of the most pristine, unspoiled and natural beauty you'll find anywhere in the world. An ample supply of deserted islands and beautiful cruising area awaits you. 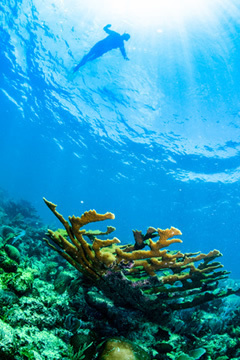 You may already know the #1 tourist attraction is the Barrier reef. This reef offers not only unlimited dive locations but also great protection from the large open ocean swells. Most people therefore find this a very comfortable place to cruise and yet, it's certainly not without its challenges! Navigating is easy as you’re rarely without sight of an island. The hardest part is learning to read the shallow waters and recognize coral! 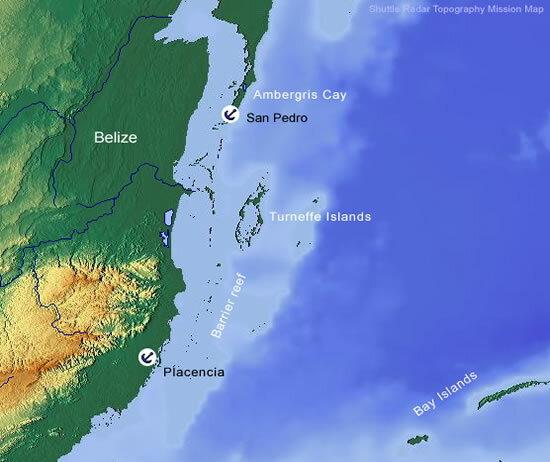 The Freya Rausher charts and sailing guide is the most accurate and informative sailing guide on Belize. When followed with a large degree of sobriety, it makes the trip quite safe. The most important advice we give in a chart briefing to bareboat customers, is that this is not like the BVI’s. You need to watch the road carefully and learn to the read the water! You can't set sail with your next anchorage plugged into your GPS, put it on autopilot and go off and make a drink. Although we give directions that steer you clear of coral heads, you still have to keep a diligent watch at all times. It's quite easy to follow the islands as you sail along, becomming quite fun to guess your positioned based on sighted angles you can gather with the hand held compass. Between that and a GPS, you should never feel lost in Belize. It's published by Wescott Publishing Company, PO Box 130, Stamford, CT. 06904, Tel" 203 322 0998 and cost is $35. Water? Not until Placencia, which means no water fills unless you are here for over a week. We're trying to increase tankage on all our bareboats to have around 130-150 gallons. This seems adequate, but conservation is a necessity. Bareboating outside the reef is prohibited mainly because the risks are too high for the team here to manage! The outer reefs are not as well charted, which makes it more dangerous everywhere coming in through unmarked "cuts" in the reef and once inside the atolls the shoal waters are full of coral rock formations that lie in so many areas in such numbers that the charts simply say "numerous coral heads or patch reefs". Communication is non-existent and we may not be able to come to you even if we knew you were in trouble. We do not have a very reliable search and rescue here in Belize and so therefore have to steer people clear of such trouble. Also, logistically speaking, if you put a hole in the hull out there, we would have to wait for a calm weather window to bring a crane and barge to assist. Once out there, we would have to complete the repair and wait for another window at our expense before bringing the barge back inside the reef. These calm times in the blue are few and far between, so it can turn into an expensive and time-consuming operation real quick. Inside the reef we can be there in a day and have the boat back in service within a week. With so much to see inside the reef in a much safer cruising area, it won't spoil your bareboat adventure to stay inside. Most people want to go to the outer atolls for the diving and because they have read so much about them, but in reality, the southern reef is every bit as pretty. U.S. gateway cities are Miami, Houston and Dallas (all only 2.5 hours away). Carriers are American Airlines, Continental or TACA. Although TACA is a “Central American” company, don’t be fooled into thinking it is inferior. In our opinion TACA is a high quality company providing excellent service and aircraft to their clients. Because of constantly changing flight schedules, we won’t elaborate on times, other than to say that most flights arrive between 12:00 noon and 3:00 p.m.
Once at Belize International, a 15 minute commuter plane with Tropic Air takes you to San Pedro, and a 30 flight to Placencia. 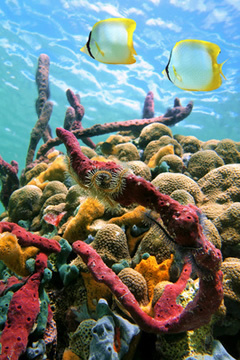 Here you will have your first breathtaking experience flying over the largest barrier reef in the western hemisphere. Many people have trouble booking Tropic Air from abroad, therefore, we can make those arrangements for you. We will provide you with a reservation # and will have vouchers waiting at the Tropic Air desk at Belize International Airport the day of your arrival. If incoming flights are delayed, it’s not a problem! They fly every hour and they know you are arriving on the international flight we tell them; they simply get you on the next flight available. If you have too much luggage, they may put some of the pieces on the following flight. Don’t be alarmed! This works well and they’re very good about making sure you get your luggage by the end of the day. In return for this inconvenience, they don’t charge people for excess luggage. Cost of this flight to San Pedro is $95, and to Placencia is $140, per person round trip. (Please note prices are subject to change.) The planes are new Cessna 208 Caravans. There are small boats that run from Belize City to San Pedro. They are more hassle than flying, but definitely cheaper. To do this you have to take a cab to downtown Belize City (Swing Bridge area). Once downtown, you have several choices. The best is the Caye Caulker Water Taxi terminal, where they have several trips per day. There are also two other boats that are enclosed, the “Triple J” which leaves at 9:00 a.m. and the “Andrea” that leaves at 3:00 p.m. Most boats take 2.5 hours from Belize City to San Pedro and are usually crowded and very uncomfortable. If your reason for wanting to pass through Belize City is to provision, please bear in mind that you now have all your luggage plus provisions to contend with for what can sometimes be a rough ride. Our recommendation would be to FLY! In Placencia and Amebergris Cays we have a working relationship with some very nice 3 to 5 star hotels near the base we would be happy to book for you. These can be accompanied by unforgettable adventure, nature, caving, bird watching, culture and archeological tours of the inland region. Please ask our travel consultant for details. The sleep aboard choice is always popular as it gets people right onboard and settled into their new home, but.... it can be a bit uncomfortable during heavy winds due to choppy water. Keep in mind, that our nearest protection is the reef a kilometer away. People sleeping aboard should use toilets in the back of our office. The shower by the pool is an outdoor style, but quite usable if they want to keep the head onboard clean until your departure. The cost for that is half day charter feel. There are plenty of restaurants to choose from in San Pedro. Most are within easy walking distance (we’ll give you a map once you arrive). As you sail south, Caye Caulker is the last island with any real dining choices. Prices are about half of what you will pay in San Pedro, but of course everything is less developed in Caye Caulker. From there south you can dine out at St. George’s Caye in a very nice dive resort and then try a fisherman’s meal at Ricardo’s Fish Camp on Bluefield Range. Next is Tobacco Caye, where there are a few basic local restaurants, and then in South Water Caye there are two more choices. That’s it until you reach Placencia, and you would need 10 days to arrive there. If you are sailing to Placencia you can re-provision there as well as having plenty of dining options ashore. Cell phones are included in all vessels because VHF communication is only good for 15-20 miles. Cell phones however provide excellent coverage within the barrier reef. In addition.....you are not charged for any incoming calls so tell your friends and family to call you at will. YES, fishing is allowed in Belize and you do not need a license. Trolling while sailing is most popular, but you can also toss a line just about anywhere and catch a fish or two. Most people catch jacks and barracuda while trolling inside the reef, but you might also catch a small snapper while at anchor. If not chartering with one of our expert skippers/dive masters on board, it is highly advised to dive with the local dive shops in the area. We know you will have a safer & higher quality dive experience, in addition to having the expert guides share their knowledge with you. If you have an accident, who do you call & how quickly can you get to the recompression chamber in San Pedro? We will only rent scuba equipment if you are taking one of our local skippers/dive masters with you. We recommend taking 2 tanks a piece as the skipper will be able to arrange fills for you along the way.